I have a strong aversion to heckling, both the giving and receiving of it. When I was studying in Britain, a friend ran for student government — despite the fact that being heckled is a traditional part of the political process there. I was horrified. Who would voluntarily put themselves through that, for a position that doesn’t even pay? Indeed, the Brits take their heckling seriously. Based on what I see on C-SPAN, in Parliament there are lots of boos and hisses directed at whomever is speaking, with a bit of contemptuous clucking thrown in. In contrast, at President Obama’s 2012 State of the Union address, Mitch Daniels shouted “Liar!” and was nearly tossed out of chambers by the scruff of the neck. Based on my very unscientific sampling of British hecklers, I’d say they aren’t trying to get a laugh from the crowd… except at sporting events, especially soccer matches. When facing a German team, for example, British fans might yell out “If you won the war, stand up.” Pretty witty, right? And it has historical significance! Hard to conjure up a speedy comeback to that one, in English or in German. I have yet to encounter such clever wit at American sporting events. I am convinced that in the United States, only the dumbest-of-the-dumb heckle… and they nearly always seem to be sitting near me. An old standby heckle at baseball games involves someone chanting, “What’s the matter with (insert umpire’s name here)?” to which the crowd responds “He’s a BUM!” Not really a side-splitter, but even when surrounded by kiddies there’s no real harm done. A few weeks ago, I had the good fortune to catch a game from just behind the San Francisco Giants dugout, so close that I could have reached out and grabbed a player (if it weren’t for those pesky restraining orders). That is Giants President & COO Larry Baer’s territory, and for the most part fans there are low-key – less because of Larry, than because they all want to look like they belong there. Not funny or clever. He even got the slow head turn and stink-eye from Momma and Papa Baer. Yet a few random folks tittered… and he was thus encouraged to continue. I’m not sure if my neighbors actually found him humorous, or if they just thought they were supposed to laugh. I’m particularly disappointed that Perez took the bait because… COME ON. This knucklehead has apparently sought to provoke him at every Indians/A’s game played in Oakland for the past four years, and his heckling is PATHETIC. 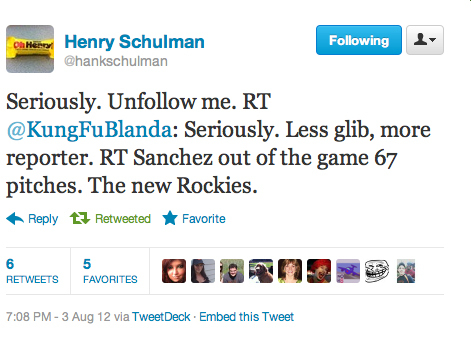 Aside from calling Perez a REALLY bad word at the end, here is the best of his heckling. Really? This is the best he could do? 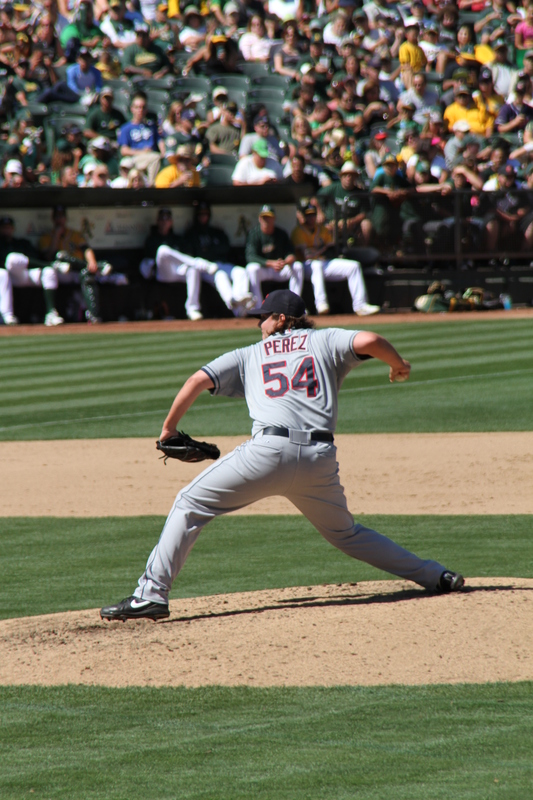 After pitching his 20th save in St. Louis on June 10, Perez threw up on the mound, in front of a stadium full of people. That’s comedy GOLD. What about something like, “Perez, you can’t save a game. You can’t even save your lunch“? But the genius heckler from Oakland went with “get a haircut”? 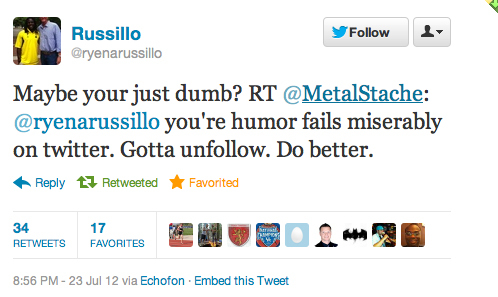 Some of the best responses to heckling can be found on Twitter. 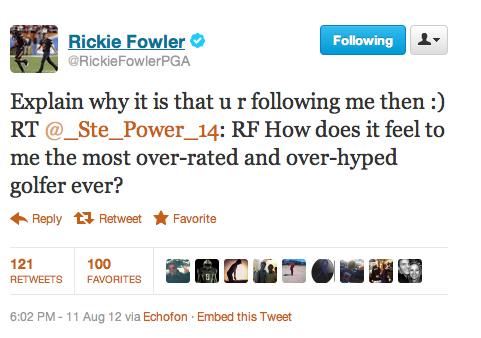 Sportswriters like Hank Schulman (San Francisco Chronicle), Buster Olney (ESPN) and Tim Kawakami ‏(San Jose Mercury News) are popular targets, as are athletes like golfer Rickie Fowler. Most Twitter cyber bullies who hide behind their anonymity, and the lack of physical proximity to the guys they seek to antagonize, usually end up looking like fools — often because they can’t spell their, there or they’re correctly. Ah meatheads on Twitter, and the wise ones who vanquish them. Two gifts that just keep giving.